Though yucca plants are succulents and include thick waxy protection and a heightened ability to store food and water for their own fuel, stress, insect and animal pests and environmental problems may affect yucca plants. Yucca plants thrive in the harsh climate of the desert, yet their sturdiness may not stand up to all problems; dormancy, illness and death may occur. Problems with yucca plants often occur due to improper care and placement within unfavorable environments. Yucca plants are native to barren areas free of frost and extended periods of freezing temperatures. Planting a yucca in a region in which temperatures plummet below freezing for extended periods will result in "freeze damage" that causes exposed areas to become blackened; the blackened areas dry out and cannot be fixed. Yucca plants may only suffer cosmetic injury, but extended sub-freezing temperature exposure may result in severe illness. Prevent this problem by covering your yucca with a cotton sheet when temperatures drop. Poorly drained soil is also a problem with yucca plants because succulent plants need soil that drains quickly. When yuccas are kept in poorly drained soil conditions, root rot or soil-borne diseases may attack the plant and result in death. Add pumice to heavy soils for faster drainage or add compost or peat moss to sandy soils which drain too quickly. Insects are a prominent problem among succulents, including yucca plants. The agave snout weevil (Schyphophorus acupunctatus) attacks in adult form; with a brown/black color and a length of 1/2 inch, the weevil lays eggs in the canes of the yucca plant; while eggs are left, so are decay microbes. The decay leads to rotting of tissues and eventual plant death. Use a broad-spectrum insecticide as a preventive control measure or choose to plant resistant species. Additionally, two types of microscopic spotted mites infest yucca plants, creating a speckled appearance on leaves that becomes gray; also, the presence of a delicate web beneath leaves may form, explains the Arizona Cooperative Extension. Uncontrolled infestations lead to yucca death. For control, keep moisture levels high by misting or washing your yucca plants, as this will remove mites; for chemical control, apply acaricides. Animal pests cause problems for yucca plants. Mice, squirrels, rats and rabbits damage yucca plants during drought conditions, completely destroying young and established plants. 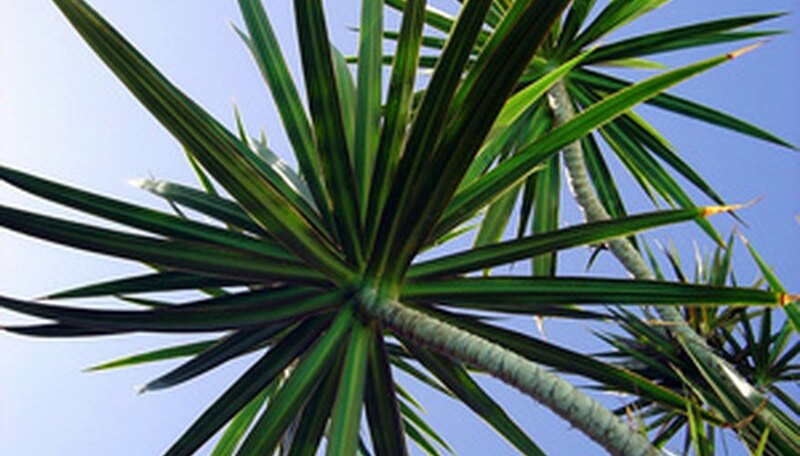 Yuccas with only mild damage may recuperate, but severely damaged plants may die. For control, set traps or poison bait with caution to avoid injuring other animals. Consider fencing around your yucca plants to keep animals away; make sure fencing is installed below ground level (approximately 6 inches) as animals can dig beneath fences, explains the Arizona Cooperative Extension.